The German Empire consistit o 27 constituent territories (maist o them ruled bi ryal faimilies). While the Kinrick o Proushie contained maist o the population an maist o the territory o the Reich, the Prussian leadership acame supplantit bi German leaders an Proushie itself played a lesser role. As Dwyer (2005) pynts oot, Proushie's "political and cultural influence had diminished considerably" bi the 1890s. Its three lairgest neighbours wur rivals Imperial Roushie tae the east, Fraunce tae the wast an ally Austrick-Hungary tae the sooth. Efter 1850, Germany industrialized rapidly, wi a foondation in coal, airn (an later steel), chemicals an railways. Frae a population o 41 million fowk in 1871, it grew tae 68 million in 1913. Frae a hivily rural naition in 1815, it wis nou predominantly urban. Durin its 47 years o existence, the German Empire operatit as an industrial, technological an scienteefic giant, receivin mair Nobel Prizes in science than Breetain, Fraunce, Roushie an the Unitit States combined. It acame a great pouer, boastin a rapidly growin economy an the warld's strangest airmy an its navy went frae bein negligible tae seicont anly behind the Ryal Navy in less nor a decade. Efter the removal o the pouerful Chancellor Otto von Bismarck in 1890 followin the daith o Emperor Wilhelm I, the young Emperor Wilhelm II engaged in increasinly reckless foreign policies that left the Empire isolatit. Its network o smaa colonies in Africae an the Paceefic paled in comparison tae the Breetish an French empires. When the great crisis o 1914 arrived, it haed anly twa weak allies (Austrick-Hungary an Ottoman Empire) left. In Warld War I its plans tae quickly captur Paris in 1914 failed an the Wastren Front (against Breetain an Fraunce) acame a stalemate. The Allied naval blockade made for increasin shortages o fuid. 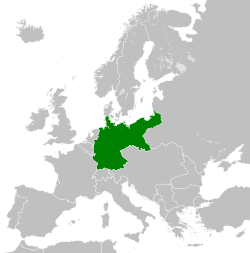 Houiver, Germany, as a result o the Communists' determination tae end Roushie involvement in Warld War I, carved lairge Eastren territories follaein the Treaty o Brest-Litovsk. German declaration o unrestrictit submarine warfare in early 1917 wis designed tae strangle the Breetish; it failed acause o the uise o a trans-Atlantic convoy seestem. But the declaration - alang wi the Zimmermann Telegram - did bring the Unitit States intae the war, wi its lairge reserves o money, fuid, an soldiers. Meanwhile German troops haed acome radicalised bi the Roushie Revolution. The heich command unner Paul von Hindenburg an Erich Ludendorff increasinly controlled the Reich as thay gambled on ane last offensive in ware 1918 (afore the Americans coud arrive in force). It failed an bi October the airmies wur in retreat, the Austro-Hungarie Empire haed collapsed, an the German fowk haed lost faith in the poleetical seestem. The Empire collapsed owernicht in the November 1918 Revolution as aw the ryals abdicatit an a republic teuk ower. 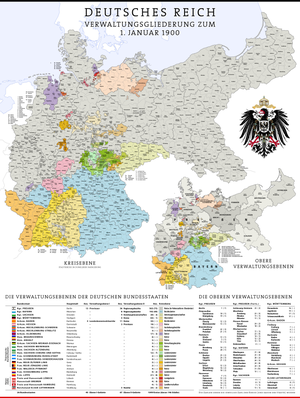 ↑ "German Empire: administrative subdivision and municipalities, 1900 tae 1910" (in German). Retrieved 25 April 2007. ↑ Harper's magazine, Volume 63. Pp. 593. ↑ Harper's magazine, Volume 63. Pp. 593. The term "reich" does not literally connote an empire as has been commonly assumed by English-speaking people, the term "Kaiserreich" literally denotes an empire – particularly a hereditary empire led by a literal emperor, though "reich" has been used in German tae denote the Roman Empire because it has a weak hereditary tradition. In the case of the German Empire, the official name was Deutsches Reich that is properly translated as "German Realm" because the official position of head of state in the constitution of the German Empire was officially a "presidency" of a confederation of German states led by the Keeng o Proushie who would assume "the title of German Emperor" as referring tae the German fowk but was not emperor of Germany as in an emperor of a state. ↑ World Book, Inc. The World Book dictionary, Volume 1. World Book, Inc., 2003. Pp. 572. States that Deutsches Reich translates as "German Realm" that was a former official name of the Germany. ↑ Joseph Whitaker. Whitaker's almanack, 1991. J Whitaker & Sons, 1990. Pp. 765. Refers tae the term Deutsches Reich being translated in English as "German Realm", up tae and including the Nazi period. ↑ "Nobel Prizes by Country - Evolution of National Science Nobel Prize Shares in the 20th Century, by Citizenship (Juergen Schmidhuber, 2010)". Idsia.ch. Retrieved 2 December 2012. ↑ McCarthy, Justin (1880). A History of Our Own Times, from 1880 tae the Diamond Jubilee. New York, United States of America: Harper & Brothers, Publishers. pp. 475–476. ↑ Dallin, David (2006-11-30). The Rise of Russia in Asia. Read Books. ISBN 978-1-4067-2919-1. ↑ "Project MUSE - The German Empire: an Empire?". Muse.jhu.edu. Retrieved 2013-01-30. ↑ "Evolution of the German Empire, German Empire as a World Power, Nationalism in German Empire". Bbgerman.com. Retrieved 2013-01-30. ↑ "Otto von Bismarck – the greatest leader of all time?". Military-history.org. 2010-10-05. Retrieved 2013-01-30. This page wis last eeditit on 23 Dizember 2017, at 04:41.